For such a small country, Scotland has given some pretty amazing gifts to the world. Perhaps the two most obvious are golf and Scotch whisky. Other countries produce whisky (or, more often, whiskey), but somehow it is Scotch whisky that has caught the world's imagination, resulting in an industry that today supports around 40,000 jobs across the UK; which each year adds about £5bn to the UK's economy; and which contributes £3.7bn to the UK's balance of trade. It is also an industry which contributes something indefinable but extremely important to the sense of what makes Scotland Scottish. It is perhaps no surprise that in recent years we have seen a large number of new distilleries being built or planned, and large-scale investment taking place at many long-established ones. On this page we discuss the background to Scotch whisky. You may also view our section about Making Malt Whisky,	which is the type of Scotch whisky produced in most whisky distilleries a visitor to the country is likely to encounter. We also have features about many individual distilleries, and these can be viewed via our Category Index to Distilleries & Breweries. Given its economic and cultural importance, it is perhaps not surprising that Scotch whisky has a legally enforceable definition. It is also protected by the European Union and the World Trade Organisation as a recognised "geographical indication": in other words something can only be called Scotch whisky if it is produced in Scotland. The legal framework for Scotch whisky within the UK was set out in The Scotch Whisky Regulations 2009 (SWR), which came into force on 23 November 2009. These replaced earlier legislation and covered not only how Scotch whisky must be produced but also established rules on how how it must be labelled, packaged, advertised and bottled. Under the terms of the SWR, Scotch whisky is whisky that has been distilled at a distillery in Scotland, and that has been matured only in Scotland for a period of not less than three years in oak casks of not more than 700 litres capacity, and has an alcoholic strength by volume of at least 40%. The regulations also stipulate that the only whisky production allowed in Scotland is of Scotch whisky. There are five categories of Scotch whisky. (a) Single malt Scotch whisky is a Scotch whisky produced by batch distillation in pot stills at a single distillery and made only from water and malted barley (and permitted caramel colouring). (b) Single grain Scotch whisky is any other Scotch whisky produced at a single distillery in Scotland. In practice this means that in addition to malted barley, whole grains of other malted or unmalted cereals have been used. It also tends to mean that distillation is done as a continuous rather than batch process. (c) Blended malt Scotch whisky is a blend of two or more single malt Scotch whiskies from different distilleries. This sometimes used to be called "vatted malt". (d) Blended grain Scotch whisky is a blend of two or more single grain Scotch whiskies from different distilleries. (e) Blended Scotch whisky is a blend of one or more single malt Scotch whiskies and one or more single grain Scotch whiskies. There are a few other points worth knowing about in the SWR. It is illegal to label, advertise or sell any drink as Scotch whisky or Scotch unless it is, and since 2012 it has been illegal to export single malt Scotch whisky except in a bottle labelled for retail sale. In terms of labelling, the category of Scotch whisky must be shown, and a distillery name may only be shown on Scotch whisky that has been wholly distilled at that distillery. Where an age description is used on a label (i.e. "aged 10 years"), that must be the age of the youngest Scotch whisky in the bottle. 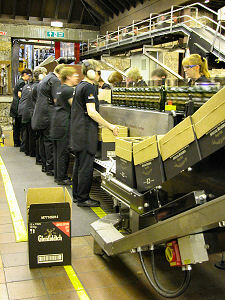 If a year of production is given on a label, then all the whisky in the bottle must have been produced in that year. Finally, the term "pure malt" is banned from labels as it was considered confusing. A few other factors help distinguish between one whisky and another, especially between single malt Scotch whiskies. When whisky is laid down to mature at the end of the distillation process it usually contains between 65% and 75% alcohol. Over the years of maturation (a legal minimum of three years, usually 10, 12 or more), some of the alcohol evaporates ("the angel's share") and by the time it is ready, the liquid in the cask will contain between 50% and 65% alcohol. Most single malt Scotch whisky is sold at a strength of between 40% and 45% alcohol. This is achieved by diluting the spirit as it is bottled, usually with distilled water, unless the whisky is being "chateau bottled" (i.e. at the distillery at which it was made) in which case the water supply used for the main distillation process may also be used for dilution. However, some whiskies are not diluted at all and are sold at "cask strength", i.e. they are bottled at the strength at which they emerge from the cask. While talking about age, it is worth knowing that the stated age on a bottle is the minimum length of time the Scotch whisky in that bottle spent being matured in casks, and the aging process stops at the point of bottling. Some distilleries sell their product in a range of different ages (12, 15 & 18 years, for example). It is usually the case that a longer period of maturation leads to a more complex and better whisky, though there are exceptions. Meanwhile some distilleries, especially if fairly newly in production or recently returned to production, have marketed single malt Scotch whiskies at as young as five years old, and the results can be surprisingly good. The final important thing to know about when looking at the labels of whiskies is "finish" or "expression". All malt Scotch whisky is matured in oak barrels that are second-hand: barrels that have been previously used to mature some other alcoholic drink somewhere in the world. As a result Scotland is the destination of a constant flow of empty and dismantled bourbon casks from the USA, sherry and port casks from Spain, and burgundy and claret casks from France, to name just a few. Whisky matured in a cask previously home to, say, port, takes on some of the character of the port and the result gives an added layer of complexity to the whisky in the cask, and an extra dimension to the range of differences that exist between single malt Scotch whiskies. But from the point of view of a visitor to Scotland, there is far more to the Scotch whisky industry than a nice tipple or a contribution to the UK balance of payments. Many malt whisky distilleries in Scotland are in beautiful locations and come complete with a character and sense of tradition that is almost palpable. Because of this, travellers have been coming to Scotland to visit distilleries for well over a century. 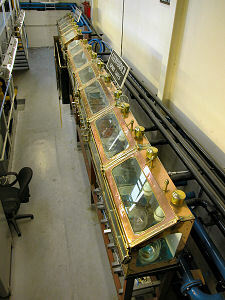 Today many distilleries run visitor centres and distillery tours that are specifically designed to give visitors a sense of the process of distillation and the particular factors that make that distillery unique. At some distilleries you can find that the visitor centre employs more people than the production process itself. 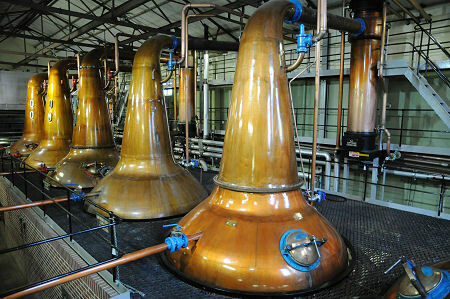 You can find our list of feature pages covering visits to particular Scottish distilleries here. 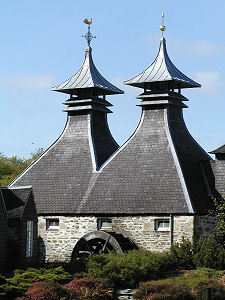 Distilleries have long cropped up in many different parts of Scotland, from the far end of Dumfries and Galloway through the Central Belt to Campbeltown in Argyll, the Isle of Skye, and Orkney. Among many new distilleries appearing on the scene in recent years or planned have been distilleries in Shetland, the Western Isles and the Scottish Borders. But two areas still reign supreme. Speyside, occupying parts of Moray and Aberdeenshire, contains the greatest concentration of distilleries in Scotland, while the island of Islay has long had an important distilling tradition and is actually seeing new distilleries open or being planned. The component parts of any distillery tour vary considerably from distillery to distillery, which is why some people enjoy visiting lots of them. But a few things are common to many, and a few more are worth thinking about in advance of your visit. Longer-established distilleries tend to be in old buildings with lots of different levels and lots of steps. Accessibility is therefore an issue at most of them and if you have issues with mobility, it is a good idea to check with the distillery in advance. And because distillation is an industrial process involving heat, some areas of a distillery need common sense and care, so there are often minimum ages set for participants on a tour which are likely to exclude very young children and babies. Some distilleries welcome photography during any part of the tour, others prohibit photography in areas of the distillery or throughout the tour. And some distilleries take visitors round free of charge, while others charge for a tour, and some have a range of tours catering to different levels of interest. Where a charge is made, it can sometimes be redeemed against purchases in the distillery shop at the end of the tour. 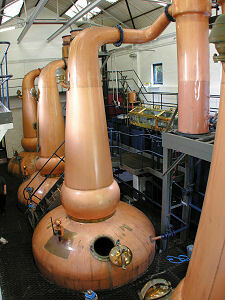 The process of making malt whisky has the same stages wherever in Scotland it is carried out. However, some distilleries only undertake part of the process on the premises: and again it is helpful to know in advance what you will, or will not, be able to see. 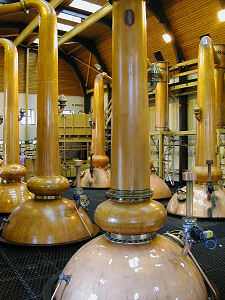 Virtually all distilleries offering tours are able to show visitors the processes of mashing in mash tuns, fermentation in washbacks and the two (or sometimes more) stages of distillation in the stillhouse. Many modern distilleries do not have maltings, preferring instead to buy their barley already malted from one of the very large industrial maltings that have been established. 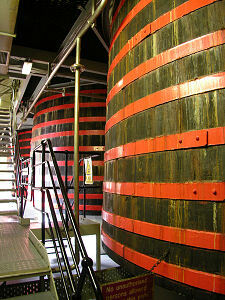 As a result only a few distilleries are able to show visitors a real malting floor and working kiln. Towards the other end of the process, some distilleries do not have their own bonded warehouses on site, or prefer not to let visitors loose in a warehouse containing millions of litres of extremely valuable but highly inflammable liquid. In these cases you are likely to be shown a mock-up of what a bonded warehouse looks like: or miss out the stage altogether. And these days it is a great rarity for a distillery to have a bottling plant on site, meaning that there are only a couple across Scotland that can be seen in operation by visitors.